I have just finished with the book and all I could think of is, sharing my views on it with the reader of this post. The only thing I dislike about reading a book series is, you get highly impatient about the next part of the series if it has not been released. The same thing is has happened with The Clifton Chronicles. The third book is due in 2013 and I just can't wait to lay my hands on it. I have reviewed the first part of the series "Only Time Will Tell" here on my blog few days back. The book has been set up during the times when the world is busy dealing with the second world war. 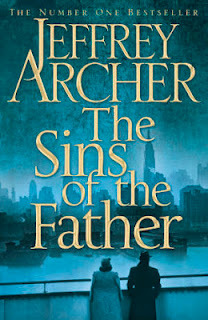 "The Sins of The Father" begins with Harry Clifton's part of the story after he lands up in America with a different identity, hoping things would get better with his lady love. Though he never expected to land up in another mess and dealing with the most horrible days of his life. During his journey, there are things he establishes for himself knowingly and unknowingly but some other person keeps reaping the benefits of it until his lady love Emma Barrington lands up in America. Very cunningly Emma plans her exit from England and lands up at America. Her quest to find that Harry is still alive gets interesting with every page. On the other hand, Hugo Barrington, is as usual up with his cunning tricks to fool people and making things miserable for himself and others around him, specially Harry Clifton's mother, Maisie Clifton. Whereas, Maisie is trying her best to keep up with her life, that never fails to offer lemons. Harry on the other hand, finally lands up in the battle field, which was his dream. Though not in the way he wanted, but what mattered to him was, he was there on the battleground and making sure that the enemies get baffled when they hear of him. Giles Barrington, on the other hand is living his life, winning accolades for himself on the battlefield and missing Harry, his best friend, at every point. Yet again, the book has stopped at such a point that has left me curious to know what is going to happen next. The most interesting thing about the series is, it focuses on so many lives together that run in parallel plots, but never fails to weave them in a single strand. You ought to be very attentive while reading the book because the moment you missed a point, you would not be able to connect the threads of the story. Eagerly waiting for the Volume 3 of the series, "Best Kept Secret". awesome review. The plot looks fascinating. i need to pick this series up. *sigh* i know about the waiting thingy for series. Almost all the books I read stretches to more than 5 books.